When you camp in the Sierra mountains of California, the night skies are incredible. Our Milky Way galaxy is splashed across the dark dome, and you can see every constellation that's normally blotted out by city lights. Now, imagine you're out there with astrophysicists, explaining it all to you. That's how I spent my summer vacation. Along with about fifteen other students, I took a unique hands-on class called Practical Observational Astronomy, taught at the San Francisco State Sierra Nevada Field Campus high in the California Sierras near Truckee. The course is part of an unusual summer program at the campus, where community members mingle with State students, and everybody camps out together in tents (thankfully, there are nice warm showers and flush toilets for us city types). Breakfast and dinner were communal affairs in a simple two-story building full of natural light that doubled as our classroom. Surrounded by trees and streams, we spent our afternoons in the camp classroom/dining hall learning everything from how to read star maps and recognize common deep sky objects, to how telescope optics work, the life cycle of stars, the basics of spectrometry, and even the fundamental structure of the universe. By night, our classroom was the heavens. We drove up to a lookout area called Packer Saddle, set up several large telescopes provided by our helpful teaching assistants, and put everything we learned by day into practice. Our teacher was Martin Sirk, an infectiously enthusiastic astrophysicist who researches variable stars at UC Berkeley and builds his own telescopes for fun. It was kind of like getting basic guitar lessons from a rock star. Martin made sure we knew beginner-level stuff, but it wasn't hard to get him speculating about advanced concepts like how to measure the mass of the black hole at the center of our galaxy. Martin's goal was to educate us enough that we could run our own star party on the last night of class. That's right — we would be graded on how well we could party. 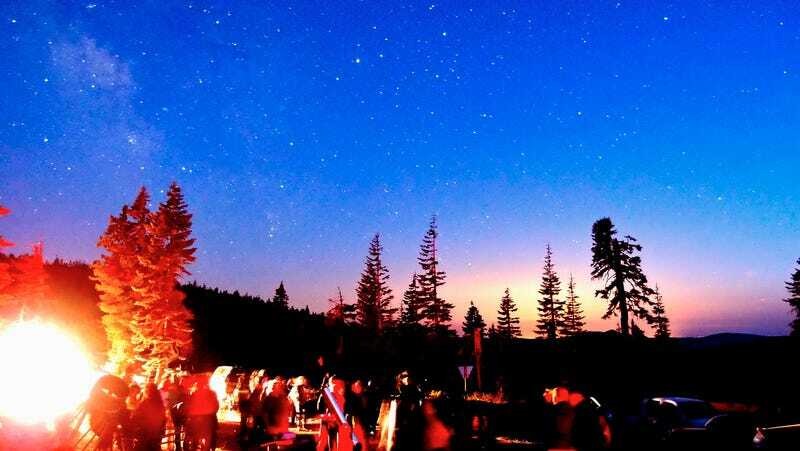 Of course star parties aren't exactly your mom's rave. Held all over the world, they're events where amateur astronomers set up telescopes so that anybody who is interested can stop by, look up into space, and learn something about it. This was a very different goal from what you'd get in a typical class, where the point is to memorize enough information to pass an exam. Instead, we needed to know enough to teach other people about what they were seeing when they looked through the eyepiece of a telescope and saw a galaxy far, far away. Knowing we were learning for very practical reasons made the classroom experience unlike any I had in college. Martin had very specific lessons each afternoon, but we could always pause for questions and discussion. One person would need to know what an electron was, while another wondered what happened to the energy released by lightwaves that were stretching along with the expansion of the universe. We answered each other's questions sometimes, and jotted down ideas in our notebooks about what kind of objects we'd want to see that night on the mountain. One day we learned about supernovas, and that night we were treated to a viewing of a supernova that was actually in progress in the M74 galaxy. With the help of Martin and his teaching assistants — most of them amateur astronomers — we saw dozens of crazy galaxies. There were galaxies that looked like nothing but clouds of dark dust and others that glowed brightly out of massive galactic clusters. We learned to look up objects of interest in a star chart and then find them with our scopes in the night sky. My favorites were the globular clusters — very ancient, densely-packed groups of hundreds of thousands of stars that orbit galaxies. They're easy to spot, but they also have an interesting backstory. It's believed that they are actually leftovers from the violent process of galaxy formation. As the galaxy swirls into shape, chunks get shot out but remain in orbit. In a telescope, they look like cotton balls with bright centers and fuzzy edges. When you sharpen your focus, you realize those fuzzy edges are thousands of tiny pinpricks of light. After a week of camping out and stargazing, we were ready for our star party. I showed dozens of people a gorgeous view of Saturn's rings and four of its moons. I taught people why the M81 and M82 galaxies look so different. M81 is a big fuzzy disc, while M82 looks like a cigar shape. Both are spiral galaxies like our Milky Way, but in one case we're viewing the galaxy from above (hence the disc) and the other from the side (hence the cigar). I would show people M82, the cigar, and then point up at the long wash of the Milky Way overhead. "That's what we're seeing of the Milky Way right now," I said. "We're on the edge of a spiral galaxy, and so it looks like a long, fat river instead of a big, spinning disc." The best part was that the longer the class went on, the more amateur astronomers came to sit in and add their wisdom (and telescopes) to the mix. A couple of Martin's astrophysicist friends came, too, and they helped us understand what astronomers learn from infrared radiation and cool gas in the universe. Lawrence Berkeley Lab astrophysics researcher Ed Wishnow, who studies infrared objects, even picked out an unusual star for me in a telescope I was using — a carbon star, whose carbon-saturated gas layers makes it appear reddish compared to the usual whitish-blue, oxygen-rich atmospheres of most stars. By the time we'd finish up every night around 1 AM, we were a lot smarter than we'd been after a few hours in the classroom. We weren't just looking at pictures and writing down formulas. We were actually going out into the field and finding the things we'd been studying. And the best part was that we got to pass that knowledge along to the public. The only downside? Now I need a much bigger telescope. If you're interested in San Francisco State's Sierra Nevada Field campus courses, they teach a lot more than astronomy there — you can learn about everything from geology and edible plants, to nature illustration, bird identification and bat conservation (yes, you need a rabies shot for the bat class, but the plus side is that you will get to hang out with cute flying mammals). Learn more at the SF State Field Campus website.